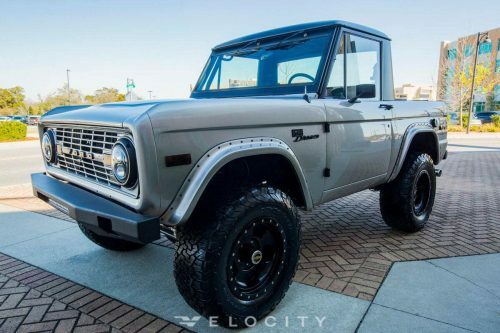 From the bottom of its Pacer wheels to the top of its hand-built 6-point roll bar, this is an Early Ford Bronco restoration that seamlessly blends classic style with modern features. At first glance, the original appeal from the late sixties commands your attention. Finished in a gorgeous Custom PPG blue and new chrome bumpers, grille, door handles, mirrors, and bezels, it looks even better than it did off the showroom floor more than five decades ago! The detail you’ll find on the custom hand-stitched brown interior is second to none. And unlike the original model, we’ve installed Corbeau racing harness because this classic Bronco is built for performance. It’s equipped with a fuel-injected Ford Racing 5.0-liter Coyote V8 engine and Velocity-exclusive Serpentine System, paired with a 4R70 4-speed transmission.